I ‘d hoped to get out birding with BJ Stacey, who I’d met on the San Diego pelagic trip, on Saturday but he had previous plans. We decided to go out Sunday the 30th (our last day), instead but it sure wouldn’t leave me much wiggle room. We should have checked out of the room by 11am but I asked if we could check out later and they let us have the room until 1pm. 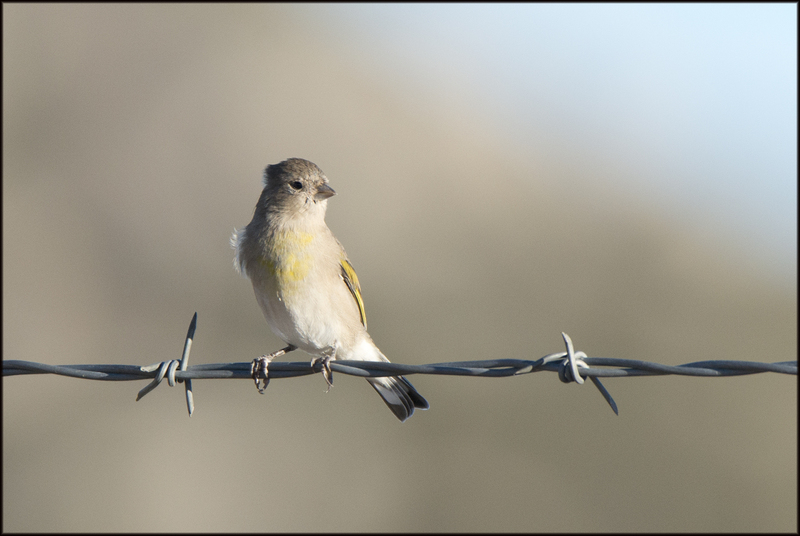 So off I went at 6am to meet up with BJ at Denny’s, leaving my car there and off we went back to the Kitchen Creek area (where I’d gone the week before) in search of Mountain Quail, Bell’s Sparrow and Lawrence’s Goldfinch. We worked Kitchen Creek Road but not much was happening. 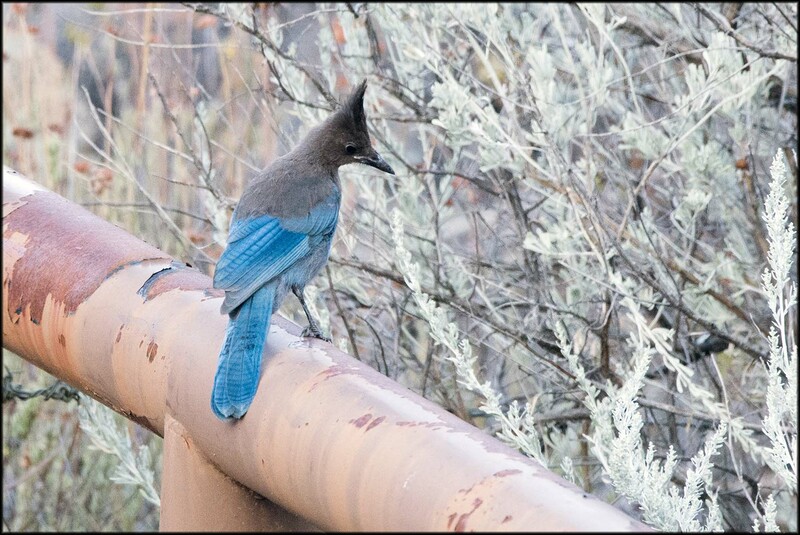 Plenty of Steller’s Jays in the area. Moving south to Old Highway 80, turning left down to the Border Patrol Office, we found the Cameron Truck Road and turned left. Along this road BJ had seen Bell’s Sparrows in the past. We pulled over about a kilometer down and began our search. 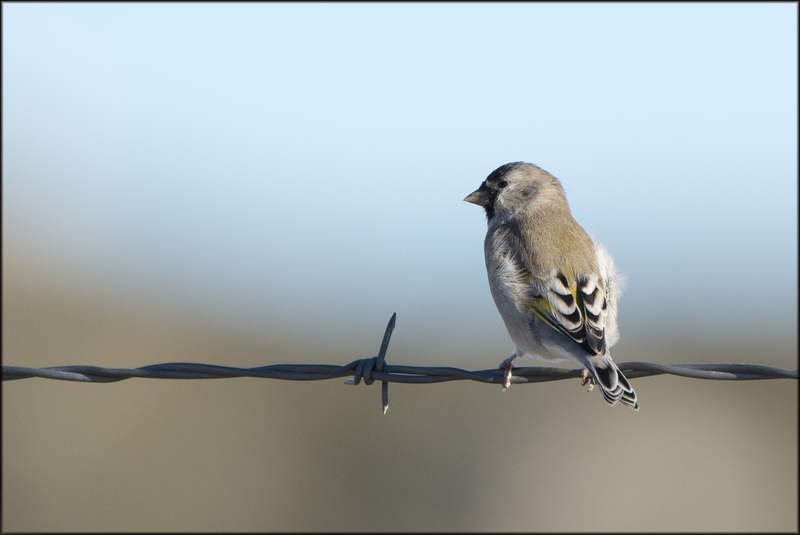 As we got out of the car BJ thought he heard Lawrence’s Goldfinch and with my hearing, I heard nothing but did see the birds flying off in the distance. 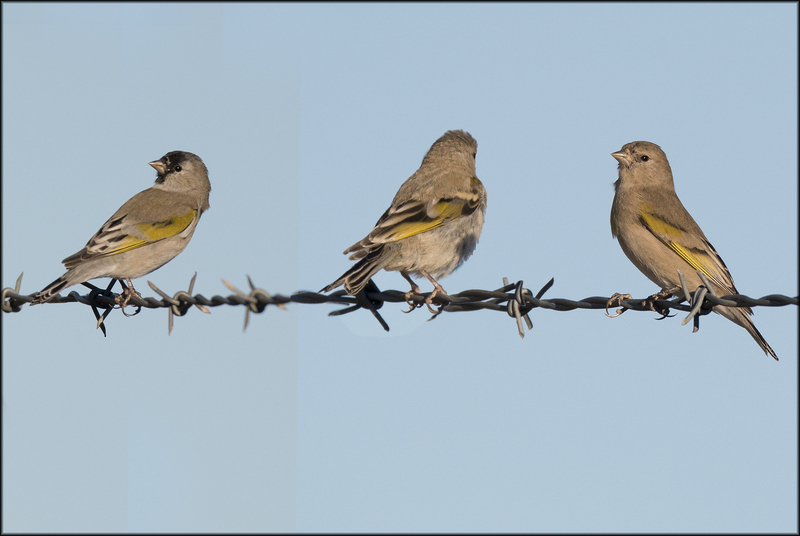 These birds were several hundred yards away by the tie they settled. Well I was already walking in their direction when BJ suggested I play my Goldfinch recording. Like magic they just flew at my recording and landed on the fence 10 feet away. Giving me the best views possible, no binoculars needed. 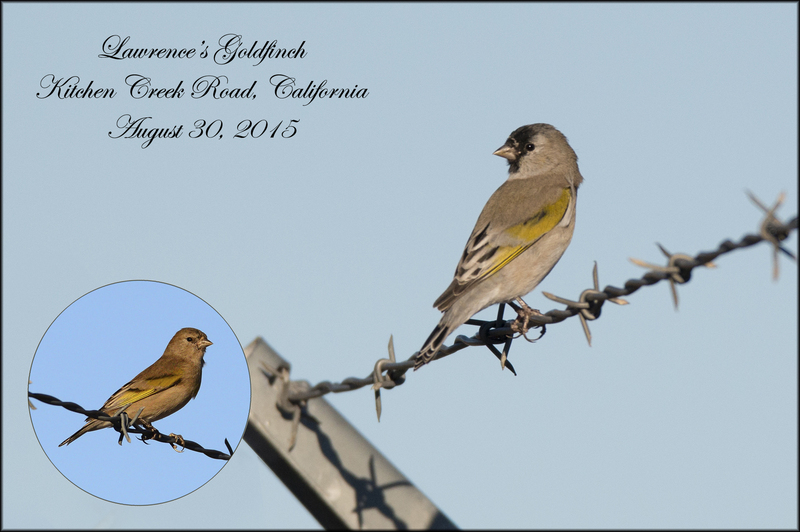 Lawrence’s Goldfinch, Life bird #705. We continued on after great views of a bird I’d been trying to see for 21 years without luck. 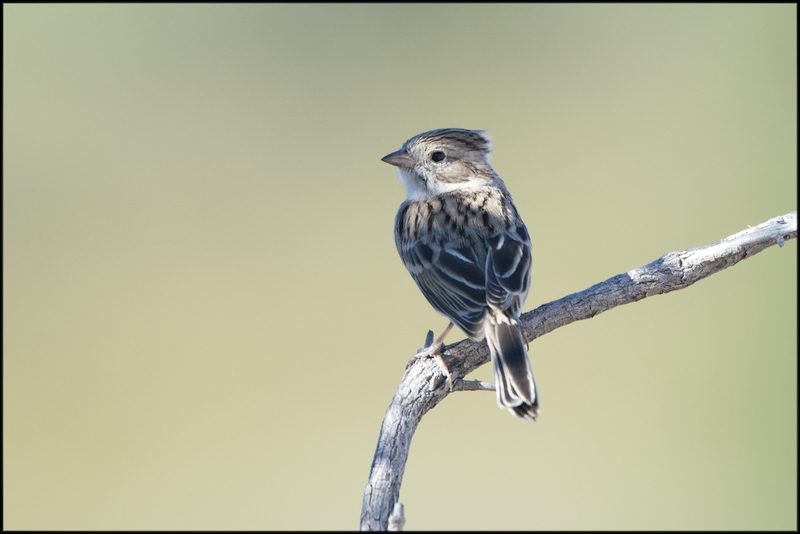 We began to spot sparrows bouncing around the sage and I had a hard time getting my binoculars on them but one look told me that they sure weren’t Bell’s. 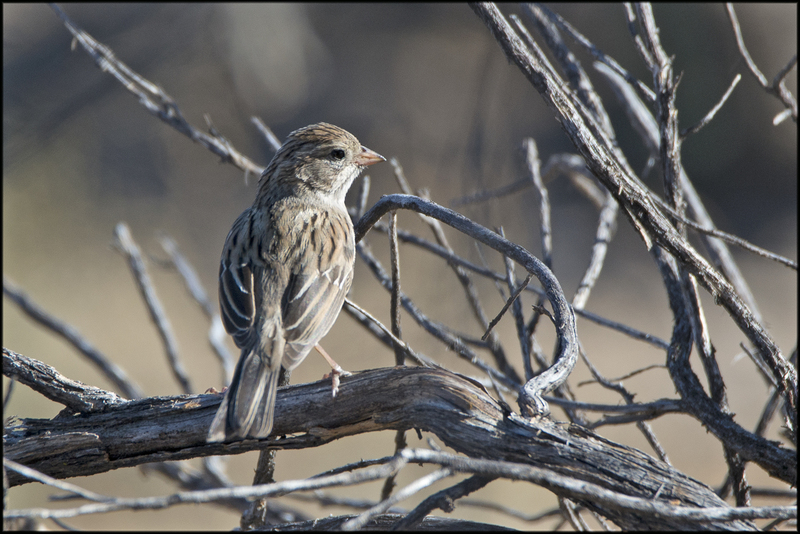 I had found a nice small flock of Brewer’s Sparrows. By this time I really had to get back. We did try a few places along the way home but time was short. I got back in plenty of time to check out and Sue and I spent the rest of the day driving around San Diego. After 10 days it was time to head home….